The Quantock Greenway has been conceived as an alternative way to explore this beautiful area, by circumnavigating the hills and taking pressure off the fragile environment on the tops. The route consists of two circular sections, the Southern route and the Northern Route, joined like a figure eight. Both loops offer a challenging day walk, or for the more adventurous the whole route can be accomplished with two overnight stops. The route is well waymarked to make navigation straightforward. We have suggested starting at Broomfield, but any convenient village on the route with suitable parking can be used. 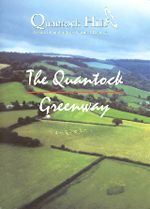 The Quantock Greenway travels through many different types of landscape, including deciduous and coniferous woodland, private parkland, grazed pasture and cropped fields. Agriculture has shaped the Quantock Hills we know over the last 2,000 years. The mixture of Saxon farmland patterns and boundaries alongside 17th and 18th century parkland creates wonderful views and is of real historic interest. The Greenway allows you to explore the farmed landscapes and discover intimate Quantock villages with inviting tea rooms, pubs and shops. The route passes through many different villages, where there are facinating historic buildings and sites of interest. The Quantock Hills AONB, like all of our Areas of Outstanding Natural Beauty, are there to be enjoyed and appreciated, but always with especial concern for the environment and the rural community. Somerset County Council, the National Trust and Forest Enterprise all have extensive estates in the AONB, but the majority of the land is owned by a mixture of large private estates and small to medium sized farms. Always give due consideration to their needs and follow the country code, as always, whilst walking this route. A detailed guide to this route is not currently available but there is a free leaflet which has a simple but clear map showing the Southern and Northern routes and indicating parking places, pubs with food, and other places with refreshments. You can obtain a copy by contacting the Quantock Hills AONB Service (details below). Alternatively, if it is more convenient, we can supply a copy to you if you are ordering another chargeable item from our bookshop.